LEGO® Star Wars™: The Force Awakens™ marks the triumphant return of the No. 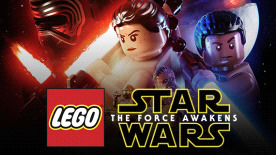 1 LEGO videogame franchise and immerses fans in the new Star Wars adventure like never before. Players can relive the epic action from the blockbuster film in a way that only LEGO can offer, featuring all of the storylines from Star Wars: The Force Awakens, retold through the clever and witty LEGO lens. The game will also feature exclusive playable content that takes players on adventures between Star Wars: Return of the Jedi and Star Wars: The Force Awakens, providing additional insight about the new movie and its characters. Relive the Blockbuster Action – Blast o into a new and improved LEGO Star Wars experience that takes fans deeper into the new lm than any other game. Exclusive New Story Levels – Experience untold adventures set before Star Wars: The Force Awakens through exclusive new story levels. Variety of Characters, Vehicles & Locations – Play as all of the heroic characters from the movie, while exploring iconic Star Wars locales, such as Jakku and Starkiller Base, and utilising a multitude of vehicles along the way. Experience the Galaxy Like Never Before – Experience the thrill of high-speed, action-packed flight gameplay like never before. Triumphantly returning ten years after it’s debut, the Star Wars Lego franchise is back with new heroes, new villains, and a new story! Not only will Lego Star Wars: The Force Awakens show the film in it’s unique and comedic way, but the game will also feature a never before seen story! Set between Return of the Jedi and the latest movie, these all-new adventures make this a must-have for any Star Wars fan.